MODEL FOR SUSTAINABLE SELF-FINANCING INTEGRATED RURAL AND POOR URBAN DEVELOPMENT FOR THE WORLD'S POOR. Sustainable fully ecological poverty alleviation in rural and poor urban environments, incorporating an innovative package of social, financial, and productive structures, with basic services necessary for a good quality of life for all, a leading role for women, and numerous renewable energy applications. Edition 26: 28 January, 2008. The summary sets out on two pages the breadth of vision of the project and the way social, financial, productive and service structures are integrated with each other. Executive summary of the project. A short summary of project goals, results and budget details. Provides a more detailed background to the project. Provides a short description of the concepts behind the project. List of project goals, results, and activities. How to get the project started. 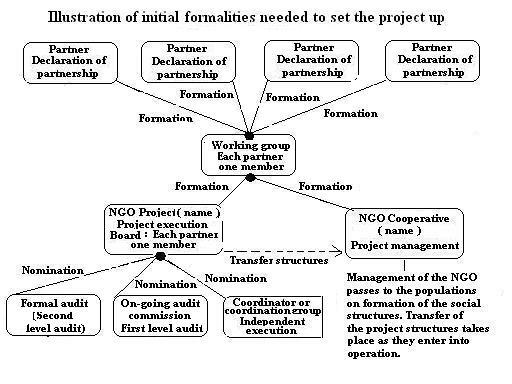 Illustration of the formalities necessary to set up project execution. English : List of questions to answer.